Situated on the south bank of the River Thames (just 230 metres away from the site of the original) is the modern reconstruction of the Globe theatre. The name of the theatre (reconstructed in 1997) comes from the original theatre, which was built in 1599, and rebuilt in 1614 after a fire, on Maiden Lane (now Park Street) in Southwark. 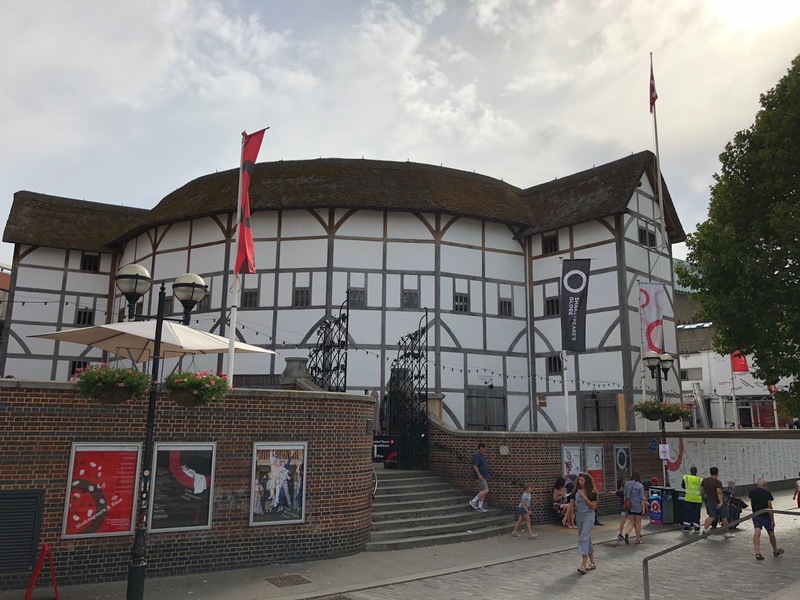 The original Globe theatre was initially owned by Richard Burbage (25%), his brother Cuthbert Burbage (25%), John Heminges (12.5%), Augustine Phillips (12.5%), Thomas Pope (12.5%) and, of course, William Shakespeare (12.5%). 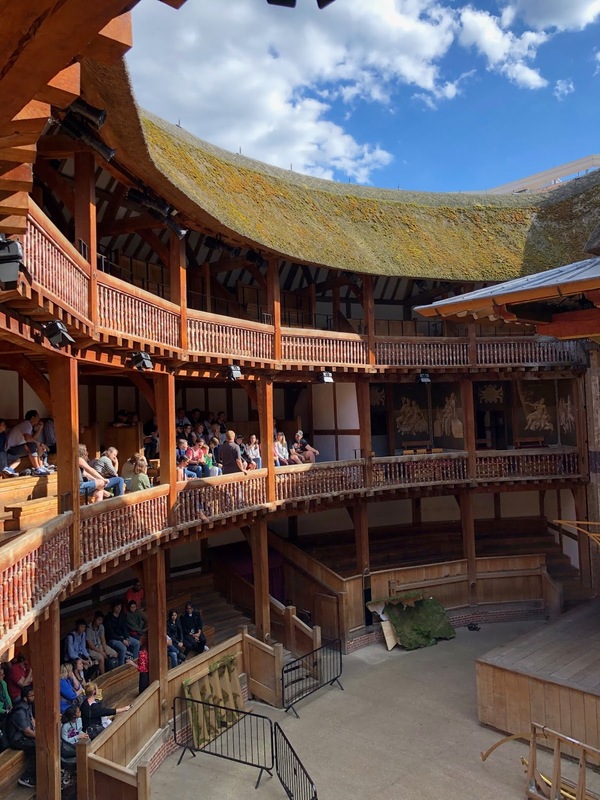 There are few other venues that embody the virtues of Historically Informed (or Inspired) Performance (HIP) to the extent that Shakespeare’s Globe does. The design of the reconstructed building is based on historical evidence and surviving sketches - with only Johannes de Witt’s sketch of The Swan theatre from 1596 showing an interior layout from an Elizabethan playhouse. The modern building was constructed using traditional materials and techniques including: English oak, mortise and tenon joints, and a thatched roof (incidentally the only new premises permitted to have a thatched roof in London since the Great Fire of 1666). The design of the reconstruction was inspired by the evidence remaining from the 1599 and 1614 Globe theatres and other evidence from archaeological excavation (c.1989) at the original Rose theatre at 56 Park Street in London. As with any historically informed activity, there is often a certain amount of compromise necessary - though it is certainly true that the attention to detail at the Globe is astounding. However, although the design is thought to be to the same proportions as the original, modern safety requirements necessitate the reduction of the audience capacity at the Globe to 857 seated and 700 ‘groudlings’ (total: 1557), compared to a total capacity of around 3000 in Shakespeare’s time. Performing on period instruments seems most appropriate here; interdisciplinary Historically Informed Performance seems to be in a very natural habitat at Shakespeare’s Globe. 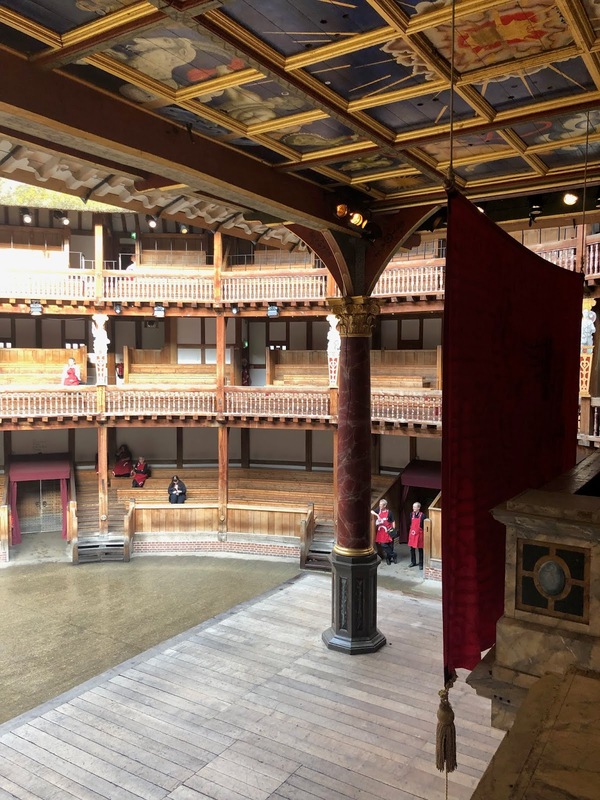 Crafted with attention to historical detail but utilised with the present in mind, the performances at Shakespeare’s Globe are groundbreaking, often modern in interpretation, and are likely to appeal to a diverse audience. Shakespeare’s Globe is a great place to be: more than just an inspiring venue, it is also a great organisation to work for. I was asked to participate in the 2018 production of Othello, deputising for one of the players in the band. My involvement began with an invitation to watch the show on Saturday 28th of July 2018 and I was able to bring my wife with me. It was a fascinating performance of Othello; I am so infrequently an audience member these days, so it was a refreshing change to enjoy a performance from the auditorium. It is such a good idea to invite those learning the show to watch the production before they participate in it. This was remarkably the first time that either of us had been inside the theatre (although my wife’s former job required her to subtitle many of the Globe’s video productions, so she was actually quite familiar with the venue and many of Shakespeare’s plays). My only experience of another Shakespeare-related venue had been from performing in Middle Temple Hall, one of the original venues where Shakespeare’s plays were performed indoors in winter. Having watched the show, I was invited to a deputy’s rehearsal on 30th July 2018, after which I had a costume fitting. I was then able to shadow the musicians during the performance that evening. This meant that I could learn where to be and what to do as the show progressed. This was particularly important as the band members had brief appearances on stage as well as: offstage, on the balcony and in various other venues around the Globe (theatre! ), with some cues requiring musical memorisation. I was in safe, experienced, hands with the two percussionists and the two natural trumpet and cornetto players that formed the regular band. On Friday 3rd of August I had my final costume fitting, a rehearsal and then two shows: a 14:00 matinee and a 19:30 evening show. The show began with various off-stage cues. We played military calls from the staircases, front of house to rally the audience into the theatre and played the last of these military calls from the balcony to begin the show. The next few entries consisted of very short interjections, cleverly based on known Venetian fanfares. It was a real thrill to share the stage with the cast - to actually tread the boards at the Globe. In one convivial scene we entered the stage to sing a drinking song, accompanied by Iago (Mark Rylance) on the mandolin (yes - he was actually playing it, not miming). The scene progressed into an energetic dance and we played (from memory) a carnival tune (by the Director & Composer: Clare van Kampen, 2018) on modern trumpets, with lively samba-style percussion. Starting with two shows in one day was a great way to begin: in at the deep end, with a chance to review and secure my earlier performance with what felt like a near-immediate second run. The artists have such incredible energy and there was a fantastic sense of camaraderie in this production. Before many of the shows, the area where the groundlings normally stand was transformed into a volleyball court (by means of a rope strung across from the stage to a wooden pillar). Most of the cast joined together to play a version of volleyball where every team member must touch the ball before sending it to over to the other side of the ‘net’. In turn, the opposing team would pass the ball to every player on their team before sending it back. It was certainly a good way to get the adrenaline running before a performance and it was an informal and very enjoyable way of meeting everybody. I participated in further shows on Saturday 4th August (matinee) and evening shows on Tuesday 7th August, Wednesday 8th August and Thursday 9th August. Even in my short run at the Globe I began to feel very at home at there. The people were wonderful and the venue was inspiring. The atmosphere was incredible in this outdoor theatre in the prime of midsummer: the evening light faded as the drama of the play became darker and Iago more devious. They probably wouldn’t give it a second thought, but I was amazed by the method acting used by the actors before their entrances, and I was in a privileged position to be able to witness it from the where the musicians frequently play from, the upper tiring house. I was able to see passing actors and actresses before they entered the stage. I witnessed Brabantio (and was affected by the contagious act of) yawning, and rubbing his eyes - while offstage - moments before a scene where he was being woken by Rodorigo and Iago. A few minutes later, an actress left the balcony to collect another actress from the concealed upper tiring house, back towards the balcony. The door would close, hiding the two actresses from the view of the audience and from all (except the band). Nevertheless, the drama continued offstage, through the medium of method acting. One would say something along the lines of “You must come quickly, Rodorigo and Iago are here…” or something like that. I was amazed by this, but I imagine complete immersion into the character can only benefit the overall performance. “The Tempest may not have survived as a play were it not for the creation of a book which collected together most of Shakespeare’s dramatic writing - Mr William Shakespeares Comedies, Histories & Tragedies, published in London at the end of 1623. 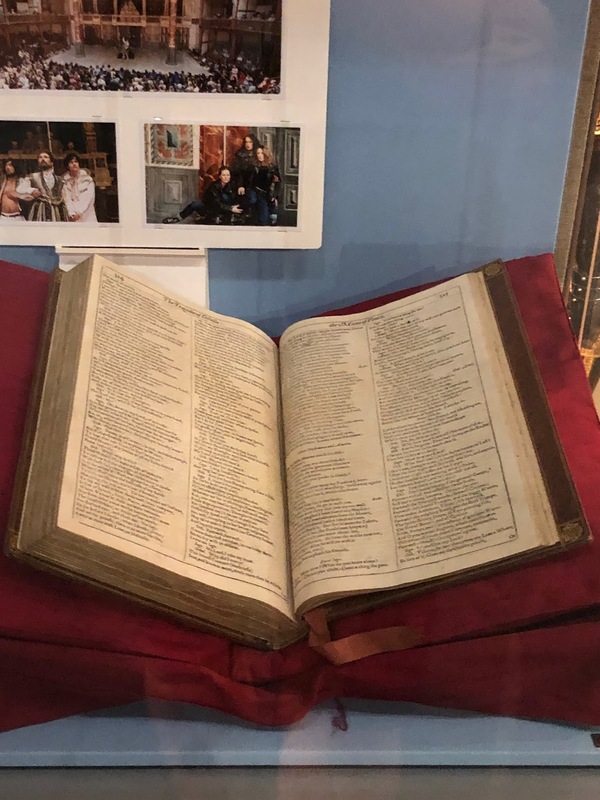 For modern readers, the book - popularly known as the First Folio - has accrued a monumental status. Without it, we may have lost 18 (nearly half) of this plays, including Twelfth Night, Macbeth, Julius Caeser and As You Like It: the First Folio provides the only source, but moreover a respectable source. It was compiled by Shakespeare’s fellow actors John Heminges and Henry Condell: both men were regarded highly enough by Shakespeare to have benefited from his will in 1616. The First Folio also provides a portrait of our author in the now-famous engraving by Martin Deoeshout on the title page. I did not tire of arriving and departing to the impressive view at Blackfriars Station (a station spanning the River Thames) and noticing the changing tidal scene between arrival and departure. The view across the river from the Globe is also great - Sir Christopher Wren lived just a short walk from the current site of the Globe during the construction of St. Paul’s Cathedral.